Walking lunges are a unilateral lower body exercise that can be done for strength development, muscle hypertrophy, and sport-specific training purposes. The lunge, similar to the step up and split squat, helps to address unilateral asymmetries and improve bilateral lower body performance in movements like back squats, running, and most athletic movements. Who Should Do the Walking Lunge? The walking lunge can be performed with a wide variety of equipment, such as barbells, dumbbells, kettlebells, and more. In the below step-by-step guide we will discuss how to properly perform dumbbell walking lunges. The steps are nearly identical regardless of what walking lunge variation you choose (see below). Start by holding dumbbells by the sides, with the torso erect. Step one foot forwards as if you were taking a big step, allowing the front heel to root itself into the floor. Once you have set the foot, shift your weight and balance forward into the lead leg, and slowly allow both knees (front and back) to bend as you descend. Often, lifters will keep too much weight in the back leg and/or not allow the back knee/hip flexor to move freely. Instead, be sure to place the majority of your weight onto the lead leg. Coach’s Tip: The front heel should be a few inches in front of the back knee. If your step was too small, the front heel will often lift at the bottom of the lunge, which is incorrect (see next step). As you approach the bottom of the lunge, you should feel the front leg strong and stable, and the full foot attached to the floor. Without stopping at the bottom of the lunge, allow the front knee to bend slightly over the toes, and begin to stand up by driving down through the floor of the front foot. You trail leg may assist you some, however your momentum should still be travelling forwards and upwards (standing up). Be conscious of what your front knee is doing. If you notice the front knee collapsing inwards, this is called valgus, and indicates poor glute strength/knee stability. Aim to keep the knee tracking out over the toes (which should be pointed in the direction you are walking). Coach’s Tip: Do not slam your knee into the floor, but rather use the leg muscles to eccentrically control the lowering position. As you stand up out of the lunge, you can begin to bring you back leg forwards, like a natural walk. Repeat the same process (steps 1 and 2) with the other leg in the front. Coach’s Tip: Before you take your next step, be sure to fully extend the knee and hip of the original lead leg, as this will help to maintain balance and complete the entire range of motion. Below is a listing of the benefits walking lunges can offer athletes of all sports. You can read a more comprehensive benefits article here. Walking lunges are a great way to increase unilateral coordination, balance, and muscular balance with athletes who train bilateral movements (squats, pulls, etc) primarily (and all of the athletes too)! Depending on the type of variation selected, increases in balance, coordination, and mobility may be affected more than others and/or target slightly different body parts. Lunges are a great movement to target the gluteus maximus (and minimus), which is critical to hip and knee stability, strength, and squat performance. Longer steps and deeper ranges of motion can also increase gluteal engagement, so pay attention to step distances and ensure proper ranges of motion. In the event you have someone you may suspect has movement asymmetries and muscle imbalances, such as they have issues with one leg, are recovering from injury, or show signs of hip shifting and/or muscle size differences; walking lunges can be a viable training option to address such issues.Focusing on proper technique and muscle development is key to help bulletproof your athlete’s movement both in the gym and on the field. 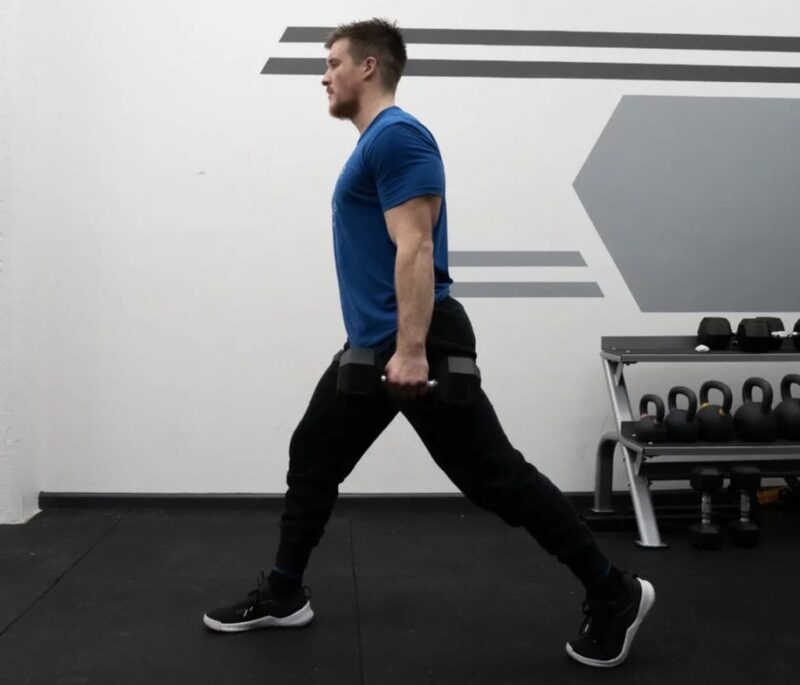 Walking lunges are a great way to increase muscle hypertrophy, as the deeper ranges of motion, vast array of angles and variations available, and constant tension on the muscle can really cause some metabolic disturbances. Longer strides will target the glutes and hamstrings, while shorted strides and more vertical torsos will increase quadriceps involvement. Below are the muscle groups involved with the walking lunge movement. Note that many of the variations above target slightly different muscle groups based in the positioning of the barbell and style of walking lunge. Nonetheless, these are some of the key muscle groups targeted. Who Should Perform the Walking Lunge? The walking lunge is a movement that can be beneficial for all individuals, regardless of sport or fitness goals. Strength and power athletes should integrate walking lunges and other unilateral exercise into their training program to help address muscle asymmetries, weaknesses, and even address unilateral leg strength. Powerlifters: The lunge is a good accessory and/or strength exercise to help increase leg hypertrophy and improve knee and hip stability. Most powerlifters train bilateral exercises, which can often mask any muscle imbalances or weaknesses, making unilateral exercises like the walking lunge a must for longevity in this intensely loaded sport. Strongman Athletes: Similar to powerlifters, strongman athletes can benefit from increasing unilateral stability and strength. Additionally, walking lunges can help aid in knee and hip mobility, improve balance and enhance muscle development in movement specific patterns (since strongman athletes must also express forms of open-chained athleticism for carries, short sprints, and non sagittal movements). Weightlifters: Olympic weightlifters can benefit from including walking lunges into training programs as they can enhance many of the same unilateral strength and hypertrophy aspects as discuss above. Additionally, these can be a good exercise to swap into lower body sessions during off season programs to increase the overall stbaility, mobility, and athleticism of an athlete. Walking lunges are a dynamic unilateral lower body exercise that can build leg strength, muscle, and improve functional movement. This is key for athletes and fitness competitors as the demands of their sports require a high degree of unilateral stability and strength. The walking lunge is a valuable lower body exercise that can build leg strength, muscle hypertrophy, endurance, and fitness. Note, that many beginners may struggle with this complex exercise, therefore it is suggested that they progress towards the walking lunge by mastering split squats, step ups, and reverse lunges (see the walking lunge alternative section below). Below are three primary training goals and programming recommendations when programming walking lunges into workouts. Note, that these are general guidelines, and by no means should be used as the only way to program walking lunges. You can use unilateral training, such as walking lunges to address unilateral strength issues, often which can impact bilateral movements like back and front squats. If you are going to train the walking lunge with heavier loads, be sure to master walking lunges at light and moderate loads to establish necessary muscular coordination. In addition to adding volume and loading, you can increase the time under tension by adding slow and controlled eccentric lowering of the body as you lunge to further stimulate muscle growth and increase balance/muscle coordination. Some lifters may want to train greater muscle endurance (for sport), in which higher repetition ranges and/or shorter rest periods are recommended. You can also perform tempo repetitions for added time under tension and fatigue accumulation. Longer sets of lunges can also be a great way to stimulate new muscle growth as well. Below are five (5) common lunge variations that can be done with most lifters to increase leg strength, balance, coordination, muscular hypertrophy, and performance. All lunge variations can be performed with any type(s) of equipment or training means. For example, the dumbbell lunge, overhead barbell walking lunge, or front loaded kettlebell reverse lunge, just to name a few. The walking lunge is a basic unilateral movement done with the lifter performing multiple front lunges in succession of one another, with or without weight. Below are some more popular (and advanced) styles of walking lunges. The front rack walking lunge refers to any style of walking lunge done with the load (barbell, kettlebell, etc) in the front rack position. Like the front squat, this position places the loading slightly in front of midline, increasing the demands upon the quadriceps, core, and back to remain in an upright position. The back rack walking lunge refers to any type of walking lunge done with loading placed upon the back, with the most common style being the barbell walking lunge. The barbell is placed upon the upper back/trap, similar to that of the back Squat, which allows for even disbursement of the load across the entire body and legs; resulting in great loads being moved. The overhead walking lunge entails a lifter to place a load overhead (barbell, kettlebells, dumbbells, etc) in a secured position while performing standard walking lunges. The overhead position of the load increases the need for shoulder mobility/stability, correct spinal positioning, and enforces a strict vertical torso in the lounge; all of which can result in increased core strength, upper back strength, and hip/knee integrity when done correctly. Any type of asymmetry can be included here, such as uneven loading of an object (one kettlebell heavier than the other), unbalanced farmers carry while walking, etc. This places a greater demand on the core and hips to stabilize against rotational forces to maintain proper spinal and hip alignment and tracking. This can be a great movement to help pattern proper mechanics for some lifters who swivel or twist at the bottom of the squat/lunge. 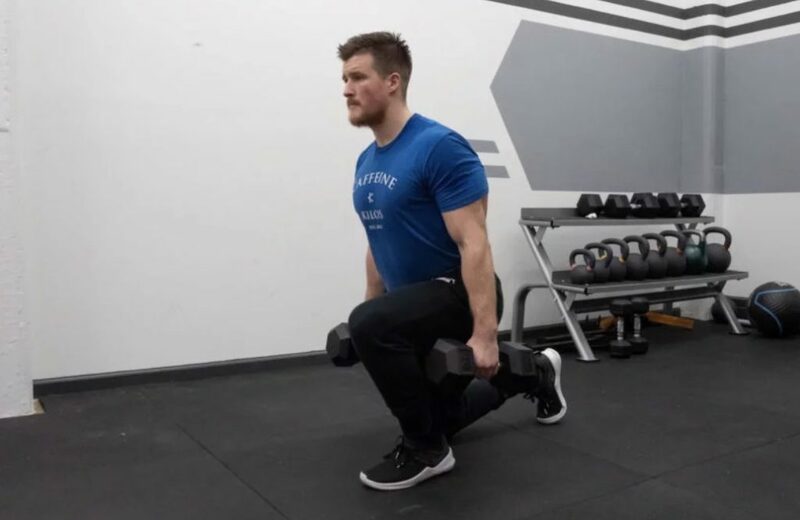 Below are three (3) walking lunge alternatives coaches and athletes can use to add variety to their lower body training and/or use to progress less skilled/beginner lifters towards more advanced unilateral leg exercises like the walking lunge. The split squat is a regressed walking lunge that incorporates the same joint actions and muscle groups as the walking lunge. 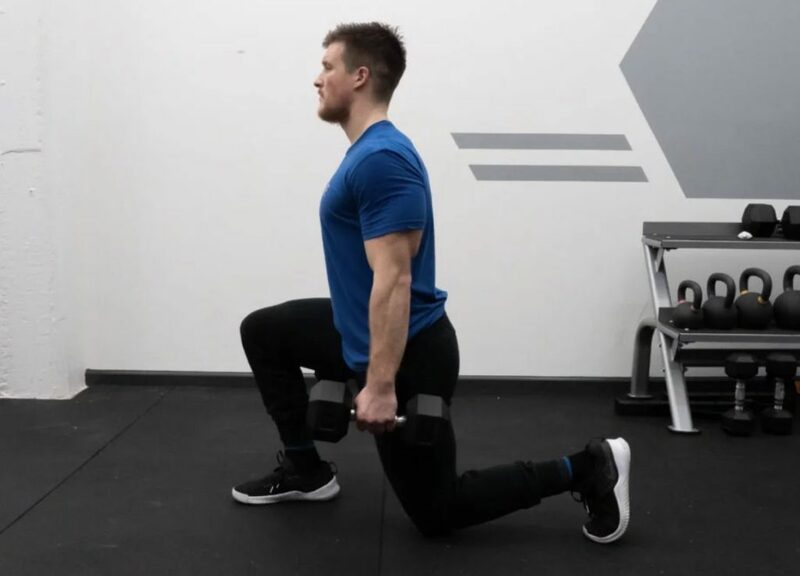 This lunge variation is done stationary, however, making it better for beginners or lifters who may have issues stabilizing loads while walking. The step up is a unilateral variation that can be done to increase quadriceps and glute strength and hypertrophy. This exercise can be used to transition a lifter from a stationary split squat to a walking lunge. The reverse lunge is a semi-stationary lunge that has a lifter step one leg backwards, descending into a lunge, and then standing back up to the original start position. This exercise targets the glutes and quadriceps (same as the walking lunge), and is a good transitional exercise to progress them towards the full walking lunge. Take a look at some other unilateral training exercise guide below and increase strength, muscular activation, and injury resilience across the entire body!